Dr. Raphael Ason began his undergraduate studies at the University of Miami and completed his studies at Florida Atlantic University, obtaining a Bachelor of Science degree in Biology. He then obtained his Doctorate of Dental Medicine from the University of Florida Dental School. He attended medical school at New York University, where he received his Doctorate in Medicine. While pursuing his M.D., he also was dually enrolled in the Department of Oral and Maxillofacial Surgery. 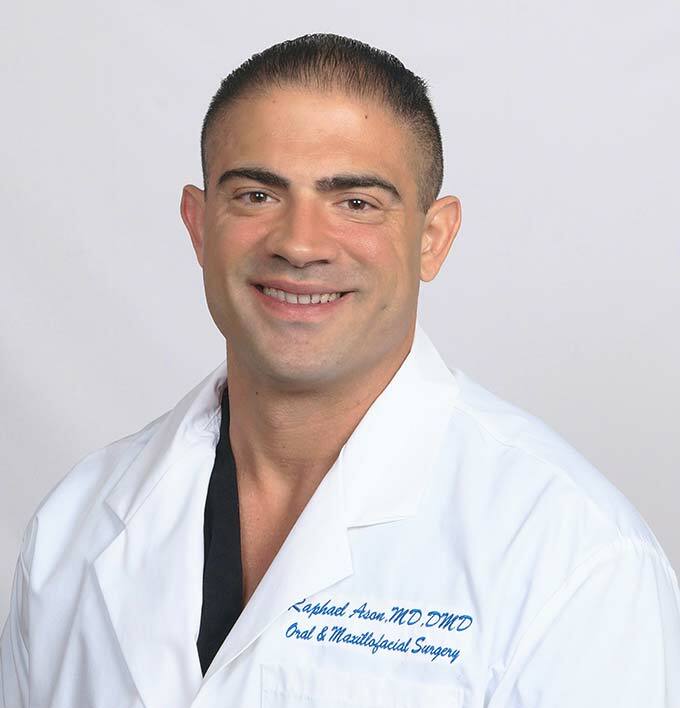 He was awarded a Specialty Certification in Oral and Maxillofacial Surgery upon completing the six-year program at NYU. While at New York University, Dr. Ason had extensive training in complicated exodontia, basic implant cases, and complex implant cases requiring bone grafts and bone-block grafts. In terms of his hospital training, Dr. Ason was extensively trained in maxillofacial trauma such as jaw fractures, cheek bone fractures, and pan-facial trauma – consisting of several facial fractures in one traumatic event. The vast majority of his training was in pathology, such as benign and malignant tumors of the jaws. At NYU, he learned how to use computer virtual surgery prior to the actual surgery. In other words, Dr. Ason can “perform” a surgery on a computer and learn exactly how to do the case before even starting the case in the operating room. This cutting-edge approach enhances the precision of the surgery, cuts down on surgical time, and ultimately leads to less pain and swelling. This technology is available in his office – ranging from a simple wisdom tooth extraction to a jaw reconstruction. He also has extensively studied and trained in Botox Cosmetic Therapy and facial fillers to enhance facial cosmetic appearance. His professional work experience includes externships in Shands Hospital in Gainesville, Florida, Shands Hospital in Jacksonville, Florida, John Peter Smith in Fort Worth, Texas, and the University of North Carolina. He then became a Teaching Fellow at the New York University College of Dentistry’s Department of Oral and Maxillofacial Surgery and moved on to become Chief Resident at Bellevue Hospital Center. The Sunshine State beckoned and Dr. Ason returned to Florida, where he has now started his own practice in Kissimmee. He is a member of the American Medical Association, the American Dental Association and the American Association of Oral and Maxillofacial Surgeons. He also has been published in the Journal of Oral and Maxillofacial Surgery and has presented once in the annual American Association of Oral and Maxillofacial Surgeons meeting.